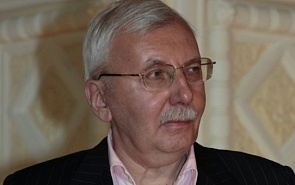 Dean of the Higher School of Television at Moscow’s Lomonosov State University. The nationalist “illness” is far advanced in Russia. But this does not mean that it is incurable or that it cannot be minimized. We should learn from the Russian Empire and particularly from the Soviet Union, which offer many positive examples and some negative ones too. What Changes Await United Russia Under Medvedev’s Leadership? There is a lot of talk at the moment about the need to update and rebrand United Russia, and this is certainly a necessary move. It is clear that Medvedev plans to consolidate the party and boost its image after taking control. The party in power may start pondering whether it should replace a weak candidate with a stronger and more promising one. They could respond with a campaign strategy of their own. It is an axiom that any ethnic or nationalist party is bad. But has anyone seriously examined whether this is so? No. The matter remains open for debate. The Russian people – the majority of Russia’s population – display the maximum possible tolerance toward other ethnic groups’ lifestyles, habits, customs, traditions, religions, and so on, but within certain limits.